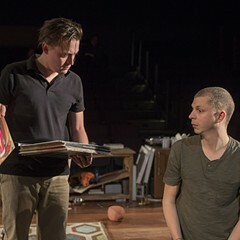 As far as I can tell, Tracy Letts has two basic points to make in his new dark comedy The Minutes, getting its world premiere now in a compellingly strange production at Steppenwolf Theatre. One of them is fairly obvious, almost banal given the current cultural moment. The other not so much. Letts's obvious point is a variation on the old saw handed down from Balzac, that the secret of a great fortune is a forgotten crime. He leads us back through layers of denial, deception, and plain ignorance to the abomination at the historical heart of a small town called Big Cherry. This being the United States, any such act is likely to involve either slavery or the Native American genocide, and though we never find out where Big Cherry sits geographically, it turns out to be better situated for the latter. Letts, who hails from Oklahoma (basically a vast holding pen for displaced tribes until it was declared a state in 1907), alludes to Indian oppression in his 2008 Pulitzer Prize winner, August: Osage County, where Cheyenne housekeeper Johnna is the only functional adult in a crowd of white folks and, ironically, the final refuge of her drug-addled, racist employer. The Minutes goes a step further. Though it focuses on the winners of the Indian wars, as the earlier play did, it puts their forgotten crime closer to the center of things. That's progress, I guess, but not what you'd call news. I mean, we've had no end of chances to examine the poisoned roots of American society lately—especially at Steppenwolf, with its recent array of let's-indict-the-audience shows. If that were all The Minutes had to offer, I'd call it well-meant but stale. Yet there's that second point—a weird, vivid, profoundly pessimistic answer to the question What is to be done?—to keep it interesting. The Minutes unfolds over the course of a single meeting of the Big Cherry city council on a portentously stormy night. 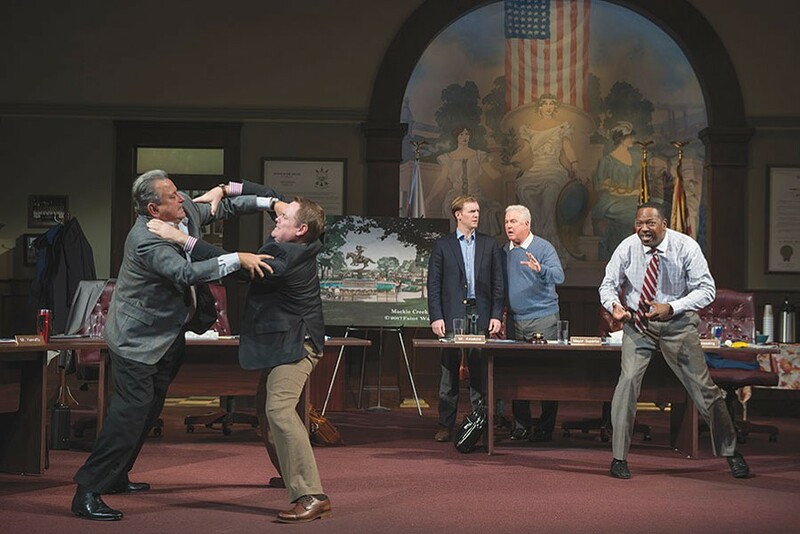 Letts, director Anna D. Shapiro, and their ensemble of strong veteran actors (from Kevin Anderson, who's ending what he calls an "acting fast" here, to the constantly working, endlessly admirable Francis Guinan) do a great job of teasing out the ethos of this particular civic ritual. The pregavel pleasantries at the refreshment cart, the public personas, personal agendas, parliamentary pomposities, thin skins, and opaque grudges are all hilariously true to life. Jeff Still's Mr. Assalone and William Petersen's Mayor Superba constitute the nexus of power as the men who know why and how the levers of authority get thrown; Anderson's Mr. Breeding is their hail-fellow, golf-playing jester. Danny McCarthy's Hanratty is a man on a hobbyhorse, foolishly thinking he can get his accessibility proposal passed on the merits. James Vincent Meredith's Blake has a hobbyhorse of his own: the Lincoln Smackdown, which is, oddly enough, exactly what it sounds like. As the longest-serving, least-informed council members, Guinan and Penny Slusher are constantly batting away proofs of their incompetence. And Brittany Burch's city clerk is at once supremely efficient and deeply pissed off. Only Sally Murphy has no clear mishegoss as Councilwoman Matz—but she manufactures one, creating a ditzy fundamentalist. Into the municipal coven falls Mr. Peel (Cliff Chamberlain), a pediatric dentist and newcomer to Big Cherry, who ran for council for the same reason he joined Kiwanis: to see if he can't pull some business from the DDS everybody goes to at present. Having been absent from the previous week's meeting due to his mother's death, Peel wants to know what he missed—an innocent question that eventually opens up a can of worms. 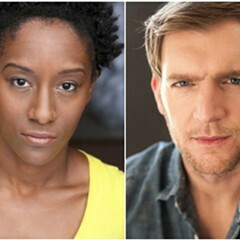 Steppenwolf Theatre Company adds two new ensemble members—but what does that mean? The bad-boy playwright is true to himself in Steppenwolf’s Linda Vista. In Anna D. Shapiro's production, Kenneth Lonergan's ugly-sweet play has affinities with an old black-and-white movie. Tracy Letts's brilliant new drama dares to be classical.